On Tuesday, Nov. 27 at 3 p.m., local musician Adrian Milanio gave a live performance just outside of Diversions Cafe. Milanio, who graduated from Pacific Lutheran University and now works there as an academic advisor, performed mostly covers of various songs. “I like all types of music, but if I had to pick any type it’d be Bruno Mars and John Mayer. They were my heroes growing up,” Milanio said of his two biggest influences. This was evident in his lineup, which consisted mostly of covers of pop, blues and soulful love ballads. Milanio’s vocals, strong and crystal clear on their own, stood out against the muted, dreamy tone of the keyboard. Milanio’s interest in music began in high school, where he played the saxophone for his school’s band and developed a love for music. 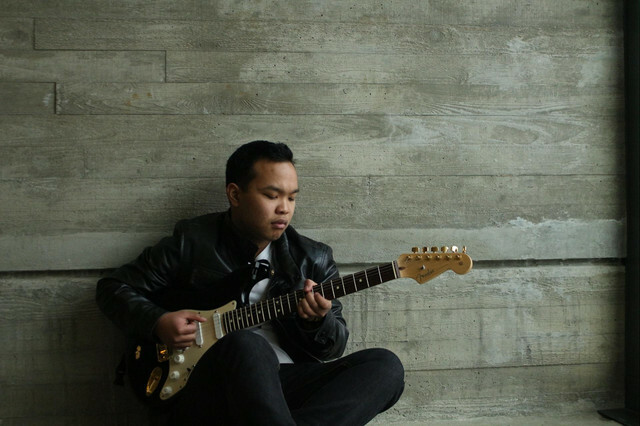 This journey of self discovery led him to take his love for music a step further, picking up the guitar and learning how to sing in order to pursue a full-fledged career in music. “Eventually it led from playing little school gigs to playing different shows and expanding upon it,” he said. Students in and around Diversions Cafe listened to Milanio’s performance, some unaware that it was taking place until he began singing. Anand Landon, a University of Puget Sound senior, is the Asociated Students of the University of Puget Sound (ASUPS) Northwest Sounds programmer who organizes monthly musical performances on campus. He also programmed the first open mic night at Diversions Cafe, and hopes that it will become a monthly event as well. “First was Mariachi Huenachi, last month was Cape Nowhere, and this month was Adrian Milanio,” Landon said. “I look for someone who really has soul when they’re performing, just in general. I don’t want to say that it’s music that I like because I am putting on a show for other people, it’s music that I like and that I think other people would like,” Landon replied when asked about how he chooses which artist/group to invite to perform. Landon, a musical artist and performer in his own right, was first introduced to Milanio and his music at a show that the two were both performing in. Today Milanio performs all across Washington, has released a successful debut album titled “Love & Culture,” and continues to release music on platforms such as YouTube and Spotify.